Nintendo DS will change the way people play video games. The Nintendo DS incorporates advanced touch-screen technology, with breathtaking 3D graphics, all in a sleek silver design. The touch screen feature allows players to get closer to the games by giving them a far more direct, faster control. Upon opening the Nintendo DS, gamers are greeted by not one, but two three inch 260,000 colour TFT screens, the bottom of which is touch sensitive. Instead of having to use the buttons and d-pad to control games, players can use the stylus, thumb strap included with the console or finger, to rub and tap their way through games. Games can easily be played with friends thanks to the revolutionary wireless functionality provided by the Nintendo DS. Up to 16 players can communicate using PictoChat, or play multiplayer games at distances of up to 100ft. 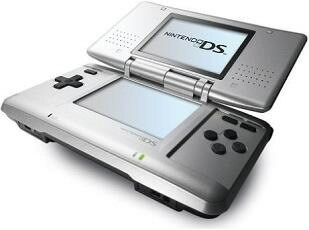 The Nintendo DS comes complete with stereo speakers and a microphone built in, setting the mood and adding to the overall interactive experience. It also features two separate game slots, one for Nintendo DS games and one for Game Boy Advance games. The Nintendo DS is fully backwards compatible with all Game Boy Advance titles, and with over 550 titles, it means you can play all of your old favourites. For Nintendo DS Bundles click here. Alternatively, you can search for Nintendo DS using our Go Shopping section. Nintendo's latest console includes all the existing features of the Nintendo DS, yet includes a variety of distinctive changes which truly sets it apart from other handheld consoles. Nintendo DS Lite retains the advanced touch screen technology, allowing players to control the software with a stylus or even their finger, as well as dual screens, voice recognition and Wi-Fi capabilities of the Nintendo DS but is now both smaller and lighter. Weighing nearly 60g less than the original, it is just two thirds of the original size. 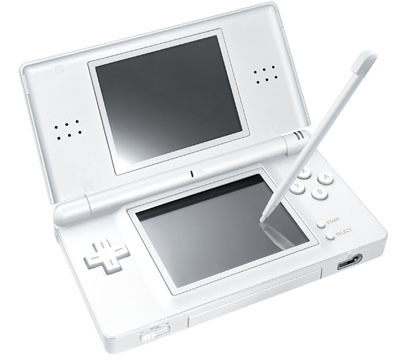 The redesign isn't only cosmetic though, the Nintendo DS Lite features adjustable screen brightness with four settings, a repositioned microphone for ease of use and a larger and more comfortable stylus. With its new design and unique features, this console is perfect for everyone regardless of age, gender and gaming skills. CLICK PICTURES BELOW FOR DIFFERENT COLOURED NINTENDO DS LITES - ALL ARE UNER £99.99 AND INCLUDE FREE SHIPPING!! For Nintendo DS Lite Bundles click here. Alternatively, you can search for Nintendo DS Lite using our Go Shopping section. We've teamed up with some top retailers to bring you a vast selection of Nintendo DS games! Just click on the links below and we're sure you'll find what you're after.